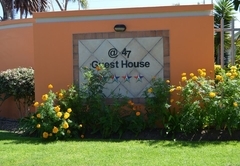 @ 47 Guest House befindet sich in einem ruhigen, gehobenen Teil von Summerstrand, Port Elizabeth und bietet hochwertige, geräumige und private Unterkünfte für Touristen und Firmenkunden. 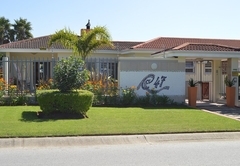 Das Gästehaus liegt günstig in der Nähe des Flughafens Port Elizabeth und Hobie Beach ist nur 1 km entfernt. 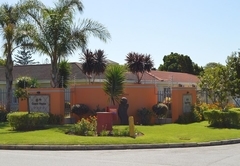 Verschiedene Restaurants, das Boardwalk- und Casino- und Unterhaltungszentrum, Geschäfte, die Nelson Mandela Metropolitan Universität, der Humewood Golf Club und alle wichtigen Attraktionen von Port Elizabeth befinden sich in der Nähe. 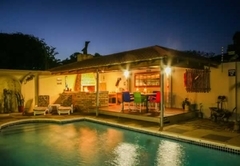 Zahlreiche Wildparks sind innerhalb von 30 bis 60 Minuten mit dem Auto erreichbar (Addo Elephant Park, Seaview Game und Lion Park und Kragga Kamma Game Park). Das Gästehaus bietet vier Doppelzimmer mit Klimaanlage, die jeweils nach einem Ort gestaltet sind, an dem der Besitzer gelebt und gearbeitet hat. Alle Zimmer verfügen über einen eigenen Eingang mit sicheren Parkmöglichkeiten abseits der Straße. Alle Räume verfügen über DSTV sowie ausreichend Arbeitsfläche für Firmenkunden. Die Küchenzeilen sind mit Mikrowelle, Minibar, Wasserkocher, Toaster, Geschirr und Besteck für Selbstversorger ausgestattet. 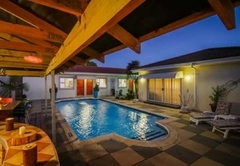 Undercover Braai-Einrichtungen am Pool können von unseren Gästen genossen werden. Frühstückskörbe können arrangiert werden. • Kleine Hunde sind nach vorheriger Absprache willkommen. 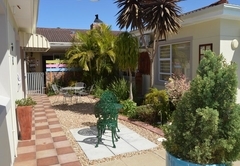 Spacious double, self-catering room with own private entrance and secure off-street parking. 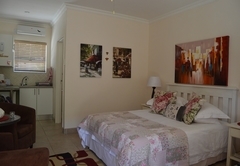 The room has a king size bed which can be converted to twin beds and en-suite bathroom with shower only. Crisp Percale linen, air-conditioning, ceiling fan, heater, DStv, WiFi and a work area for corporate clients complete the picture. 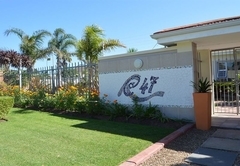 Kitchenette is equipped with a microwave, bar fridge, kettle, toaster, crockery, cutlery and complimentary coffee, tea and rusks. 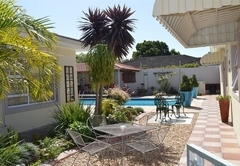 Guests are welcome to make use of the undercover braai area and sparkling pool. Breakfast baskets are available. It permits guests to have their breakfast at their leisure without set time limits and not having to rush to make breakfast time. 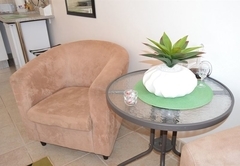 Spacious, double room with private entrance and secure off-street parking. 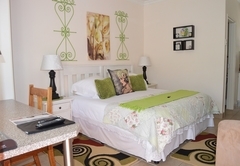 The room has a double bed, a single bed or double bunk, can be added. 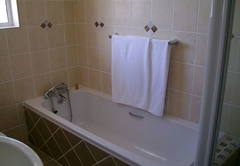 En-suite bathroom with shower and bath. Crisp Percale Linen and towels, DStv, air-conditioning, ceiling fan, heater, WiFi and a work area for corporate clients complete the picture. Kitchenette is equipped with a microwave, bar fridge, kettle, toaster, crockery, cutlery and complimentary sherry, coffee, tea and rusks. 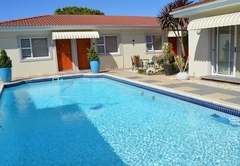 Guests are welcome to make use of the undercover braai area and sparkling pool. 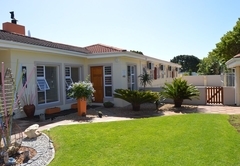 Spacious double self-catering room with own private entrance and secure off-street parking. 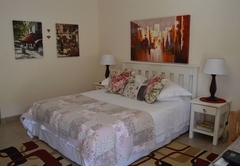 The room has a king size bed which can be converted into twin beds. En-suite bathroom with shower only. 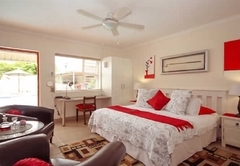 Crisp Percale Linen and towels, air-conditioning, ceiling fan, heater, DStv, Wi-Fi and a work area for corporate clients complete the picture. 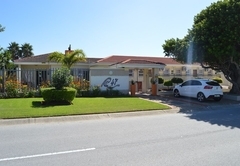 Kitchenettes are equipped with a microwave, bar fridge, kettle, toaster, crockery, cutlery and complimentary coffee, tea and rusks. 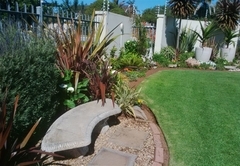 Guests are welcome to make use of the undercover braai area and sparkling pool. Breakfast baskets are available. It permits guests to have their breakfast at their leisure without set time limits and not having to rush to make breakfast time. 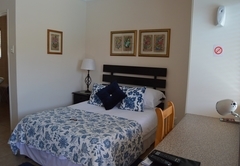 Spacious double room with private entrance and secure off-street parking. 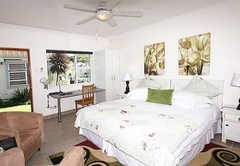 Room has a queen bed and en-suite bathroom with shower only. Crisp Percale linen and towels, DStv, air-conditioning, ceiling fan, heater, WiFi and a work area for corporate clients complete the picture. 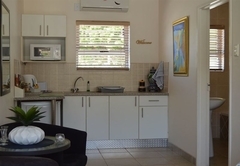 Kitchenettes are equipped with a microwave, bar fridge, kettle, toaster, crockery, cutlery and complimentary coffee, tea and rusks. 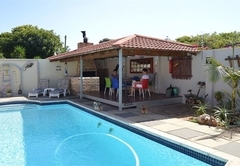 Guests are welcome to make use of the undercover braai area and sparkling pool. Breakfast baskets are available. It permits guests to have their breakfast at their leisure without set time limits and not having to rush to make breakfast time. Everything was just as promised and actually even more. Renette was a superb hostess.